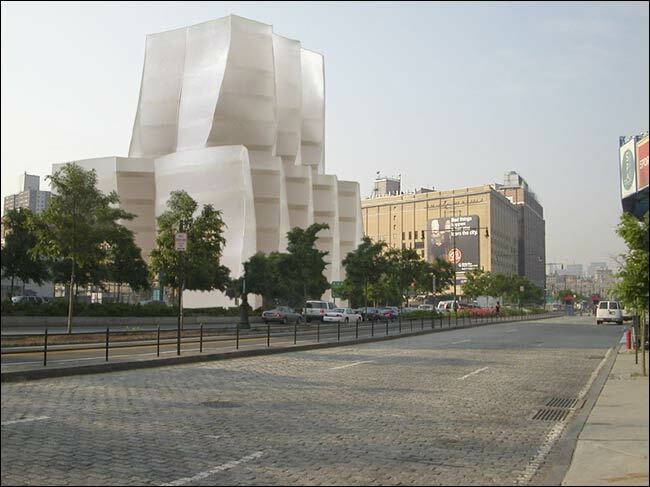 Frank Gehry's design for InterActiveCorp's New York headquarters, to be built on the West Side Highway near the Chelsea Piers complex. The proud city sails on. Frank Gehry has designed a New York headquarters for Barry Diller, the media and e-commerce mogul. The new building will be opposite the Chelsea Piers sports complex, on the West Side Highway between 18th and 19th Streets. It will also be on the East Side of Bicoastal City, the dual metropolis that has emerged from the symbiotic cultural competition between Los Angeles and New York. Buda, meet Pest. Looking something like a tall ship in full sail, the nine-story glass building will house offices for Mr. Diller's InterActiveCorp, a group of Internet businesses with a focus on travel. They include Expedia, Hotels.com, Hotwire.com, Citysearch and Ticketmaster. With typical Gehryesque frankness, the design appears to reflect New York's present preoccupation with ornamental building tops. If the top is what counts, why bother with the base and shaft? Just go for the crown! Seen in this way, the low-rise Diller building evokes the grand tradition of skyscraper design epitomized by the Empire State Building, the Chrysler Building and 70 Pine Street. It has all the romance of those towers, but at a more human scale, as befits the horizontal sweep of the riverfront location. The articulation of the glass facades also breaks down the bulk. From the West Side Highway, the building appears to be composed of individual modules, stacked in two tiers. Each of the modules is formed by giving a five-story rectangular solid a one-quarter twist. The edges of the rectangles become curves. Mr. Gehry has used a single example of this module once before, for an office building in Hanover, Germany. Here, he groups them together to fill the zoning envelope of allowable bulk. On the side facing the river, the elevation will resemble a row of five glass town houses, crowned with three stretch penthouses. The upper tier is set back from the lower, to allow open, rooftop terraces. The facades are nearly plumb with conventional building lines, especially along the side streets, where the walls are again broken down into smaller envelopes. Undertaken by InterActiveCorp in partnership with the Georgetown Company development firm, the building, scheduled for completion by early 2006 and with 165,000 square feet, will eventually provide quarters for about 500 employees. There will be underground parking for 70 cars. Though Mr. Diller will retain offices in Los Angeles (in a building to be remodeled by Mr. Gehry), the new building, signifies a shift in his business interests from entertainment to tourism, which has itself emerged as a leading form of entertainment in the era of globalization. Glass is the key feature in this design. Indeed, even more than Christian de Portzamparc's LVMH Tower on East 57th Street, the Gehry design could radically transform the use of glass in New York buildings. The design employs super-clear "white" glass, etched with a white pattern that helps reduce energy costs. Visually, the effect is somewhat ectoplasmic, as if to denote that more and more of us have two addresses now: one on the street, the other in cyberspace. I have my own version of the "broken windows" theory of urban decline. It's called the "cheap glass" hypothesis. Both concepts deal with the power of small causes to produce big effects. The broken-windows theory, which got great play in the Giuliani administration, states that when smashed panes aren't quickly repaired, it signals neglect and decline. Neighborhoods become targets for burglars, who beget drug dealers, prostitutes, muggers, murderers. The cheap-glass theory states that when so-called "value engineers" are hired to reduce building costs, mirror glass quickly follows. Mirror glass induces low self-esteem, depression, poor citizen morale, reduced productivity, strained personal relationships and ultimately broken windows of the soul. This is not the way to go. New York has missed out on glass. People came to associate it exclusively with International Style office towers of the postwar decades. In response to a glut of that architecture on the market, architects and clients began to look nostalgically toward pre-war masonry buildings. The glut now is of brick and cast-stone buildings that appear entirely constructed of processed cheese. Perhaps it was good to get away from glass for a while. A design like Mr. Gehry's gives the material some of the novelty it possessed early in the last century. Because of technological advances, glass should be seen as a luxury material, not as a cheap way to enclose space. Its use should be encouraged by government agencies with the power to grant financial incentives to developers. After Richard Meier's two new residential towers on Perry Street, the Diller building will be the third great piece of glass architecture to arise on the West Side Highway. The project arouses visions of a strip of first-rate contemporary design stretching alongside the new promenades of Hudson River Park. Perhaps nothing can fully compensate for the loss of the great trans-Atlantic liners that sailed off in the early 1970's. But it helps immensely to see the architectural imagination at work in a design that captures the lure of faraway places. Though he would loathe the comparsion, Muschamp's prose resembles the interior of an overblown Baroque church, filled top to bottom with ornament and curlicues. There's a message in there, but you have to look past a lot of frippery to find it. The fellow should take a step back from from all the hyper-modern architecture he's constantly overpraising and seek in his writing to emulate Mies van der Rohe. Simple, clean lines go a long way. Oh; actually I just saw a picture of it. I love it...lol. Munch...could'nt you have just wrote it looks like the top of TWC...lol. I can't wait to hear what the NIMBYs complaints about this one will be. 5) The battered warehouses that would have to be razed were once visited by Edgar Allan Poe in 1845. But one of these concerns would be enough to delay the project for months, if not years. All five...foggedaboutit. Really funny, JD. You completely summed it up! Perfect location for a signature building. I like to see the waterfront developing as a showcase. Hurry before Trump-like development oozes south. Indeed, it resembles a vertical display of thick slices of fish. Bravo. Comment on point 4. I thought NIMBYS were already the rampant gentrified lol. Franky's architecture is not liked by everyone, but I like his work. However, the render of InterActiveCorp's New York HQ looks more conceptual than an actual planned structure. Needs a couple of obvious windows at least. Could be nice. Love seeing the continued "glassification" of the West Side Highway. This will be one hell of a postcard someday. The former showing vague window outlines (I just thought they were horizontal features) and the latter showing more obviously, the windows. privately-held diversified real estate company based in Manhattan. brands and be as interactive as we and Frank Gehry can conjure. Raised in Toronto, Canada, Frank Gehry moved with his family to Los Angeles in 1947.
profitable interactive commerce company by pursuing a multi-brand strategy.